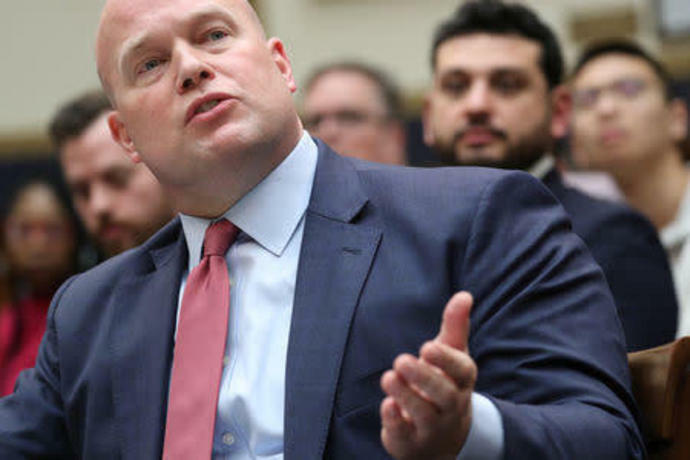 WASHINGTON (Reuters) - Acting U.S. Attorney General Matthew Whitaker snapped back on Friday at newly emboldened Democrats in Congress who are pushing for information on the special counsel's Russia probe as they try to put President Donald Trump's administration under greater scrutiny. Democrats, who took over the House of Representatives Judiciary Committee after last year's midterm elections, accused Whitaker of being evasive in front of the panel and frequently clashed with him. "Mr. Chairman, I see that your five minutes is up," Whitaker said, in a bold challenge to the head of the committee. "I am here voluntarily. We have agreed to five-minute rounds," he added. "Answer the question please," Nadler replied. "How the heck did you become the head of the Department of Justice?" Democratic Caucus Chairman Hakeem Jeffries later railed at Whitaker. "I have not talked to the president of the United States about the special counsel's investigation," Whitaker said. In one case, he refused to answer Democratic congresswoman Sheila Jackson Lee's questions with a yes or no, and made a flippant remark about whether the time she had lost on the clock had been restored before he answered her questions. "Mr. Attorney General, we are not joking here and your humor is not acceptable," she said. Trump has repeatedly said there was no collusion between his campaign and Russia and has called Mueller's investigation a witch hunt. "Bring your popcorn," he said. Collins repeatedly tried to cut Democrats off from asking questions unrelated to Whitaker's current role at the department. "When career officials at the department recommended that you take steps to mitigate your apparent conflicts of interest, ... you ignored them," Nadler said. "I had no conflict of interest," he insisted. "Ultimately, the decision whether or not to recuse was my decision." "I have been on the record about my respect for Bob Mueller," Whitaker said. "I have no reason to believe he is not honest."